A couple of cycles of time changes and some power outages finally resulted in my having to sit down and re-program my light timers so that lights come on and go off at useful times. This is a task I always put off as long as I possibly can. It's just an awkward endeavor all round. First one has to fetch each timer, which means crawling on the floor and reaching under or behind bulky pieces of furniture. And then one has to remember what all the little buttons do. 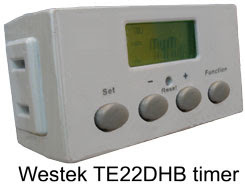 Amazingly enough, I had not only saved the instruction sheet for my Westek TE22DHB timers, I even remembered where I'd put it. Reading that tiny type was another matter entirely. Thank goodness the internet found a PDF of the instructions sheet. And thank goodness for the entire concept of Zoom In. The Westek TE22DHB offers 20 programmable ON/OFF settings per week. Per week! The power! The possibilities! 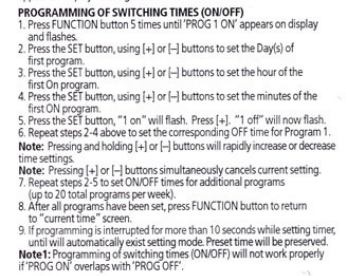 The complexity of button pushes! I get it - you might want one set of behaviors Monday through Friday and a different set on Saturday and Sunday. Or even/odd days of the week. Or front/back halves of the week. Me, I'm happy to settle for turning the light on at 5:30 a.m., off at 8:00 a.m., then on again at 4:00 p.m. and off at 9:30 p.m. Yes, I'm sure that the Internet of Things allows me to do all of this through my phone, but I'm not quite there yet.